Celebrate National Pie Day, January 23rd by making a delicious pie. Check out my pie article in the Great Falls Tribune, Wednesday, January 20, 2010. Some people crave cake for dessert. Others are loyal pie patriots. My dad falls into the latter category. He always has, for as long as I can remember. For years, he’s stopped at the Home Cafe in Conrad on the way to the family farm for a cup of soup and a piece of pie, prefer­ably banana cream or coconut cream or occasionally cherry pie with ice cream. This has earned him the nick­name “The Pie Guy” from at least one waitress working there. And it isn’t at all unusual for my mom and dad to have a piece of pie for breakfast. Yes, for breakfast.When I was growing up, I remem­ber listening to Bill Cosby’s “Chocolate Cake for Breakfast,” the hilarious monologue about the morning his wife woke him up at 6 in the morning and told him to go downstairs and cook breakfast for his children. So he asked her, “What do you want for breakfast?” Somehow she saw right through him to the chocolate cake on the counter and said, “Can I have the chocolate cake?” Cosby thought, “Chocolate cake for break­fast? That’s ridiculous!” But at the same time, the list of cake ingredients ran through his head — eggs and milk and wheat. Suddenly he thought, “Oh goodie! That’s nutrition!” and announced, “Chocolate cake, coming up,” and sliced it and served it to his 4-year-old. I think hearing Cosby talk about the “eggs and milk and wheat” thing struck a chord with my parents. Chocolate cake for breakfast? Why not pie for breakfast? And they haven’t looked back since. But the topic of making pie wasn’t always so funny, I hear. It does seem odd that the first expression that comes to mind when you think of pie is “it’s as easy as pie” because really, as many home bakers will attest, the first encounter with creating a crust can be dicey. That’s something my dad found out many years ago. As the story goes, Dad walked into the kitchen, shortly after he and my mom were married, to find my mom struggling with a pie crust. She was rolling it to shreds and then coming back to patch up the holes. This doesn’t sound like my mom to me, but my dad swears it’s true. For some reason, my dad thought it might be a good idea to step in and make some sug­gestions about making a pie crust, but not until after he had mentioned that this was not the way his mom did it. This, too, is hard for me to believe, knowing how wise my dad is and all. My dad describes what hap­pened next as “a period of uncomfortable silence.” Then came the kicker, “Well, then, maybe you could show me,” my mom said, and for some reason my dad moved right in and pro­ceeded to take over. Immediately he recognized something was wrong. The crust had stuck to the rolling pin until the entire pin was encased in dough. So he recommended “a little more flour,” not realizing there was no longer a “we” involved in the project. He proceeded to add more and more flour until he had achieved something that looked and felt like “a hockey puck,” to quote my dad. Finally realizing his efforts at making a pie just like his mother did were fruitless, my dad heaved the hard little mound of dough into the garbage. Lucky for me, somewhere along the way, we inherited Gar­net’s pie crust recipe, a tried-and­true method of mixing up a fool­proof flaky pie crust in no time. Garnet and “Dutch,” as we always called her husband Henry, Dahmer lived across the street from us when I was grow­ing up, and we often wandered over to see what Garnet was cooking in her kitchen. It was always something wonderful. Because it contains oil, Gar­net’s pie crust clings together nicely. Rolling it between two sheets of waxed paper prevents the pie dough from sticking to the rolling pin (if only Dad had known). The recipe makes two crusts, so usually I bake both and wrap one tightly in plastic wrap and freeze it for later. If you’re using it with a fruit filling, you obviously would fill it first and then bake it according to recipe instructions. The recipe I am sharing is a cream pie that doesn’t require baking, so I baked the crust first, let it cool and then filled it and chilled it. To celebrate National Pie Day, I’m making a White Choco­late Macadamia Nut pie, using Garnet’s pie crust recipe. I might just take a few slices over to share with Mom and Dad, for breakfast, of course. In a medium bowl, mix all ingredients together with a fork until combined. Gather dough into a ball. Divide dough in half and shape into two balls. Cut two sheets of waxed paper about 12 inches by 12 inches. Place one ball of dough between sheets of waxed paper and roll out to 12-inch circle, about Þ-inch thick. Peel off top layer of waxed paper and invert into 9-inch pie dish. Peel off waxed paper from top of dough and crimp edges. Repeat steps 3-6 with second ball of dough for second pie or top crust. Before making this recipe, which I created, read through the entire recipe. You need to melt the white chocolate with the cream and chill it overnight before making the pie filling. The assembled pie does need to chill, so it requires a bit of planning. Don’t let this stop you, though. It’s an easy recipe with wonderful results. In a medium saucepan over medium low heat, combine cream and 4 ounces white choco­late. Heat and stir until chocolate is completely melted and mixture is smooth. Add almond extract and stir. Transfer mixture to a small mixing bowl, cover with plastic wrap and refrigerate overnight. Make Garnet’s pie crust. Press 1 cup macadamia nuts into crust and bake in preheated oven for 10-15 minutes until nuts are lightly toasted and crust is light golden brown. Remove baked crust from oven and let cool on a cooling rack. While crust is cooling, beat white chocolate mixture with electric beater until light and fluffy. Make sure all of the mix­ture is beaten or pie filling will be runny. Using a rubber spatula, gently fold sweetened condensed milk into beaten white chocolate mix­ture. Make sure it is fully incor­porated. When crust is completely cooled, spoon pie filling into crust. Chill in refrigerator until set, at least two hours. 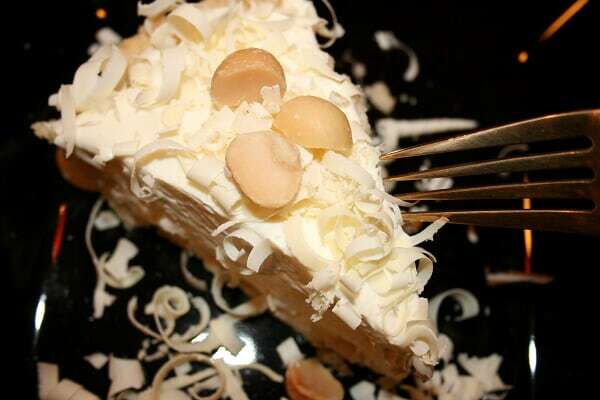 Garnish pie slices with white chocolate curls (use a vegetable peeler to make curls with remaining 4 ounces of white chocolate) and remaining macadamia nuts. I am in the middle of a redesign. The new site will be more user friendly.